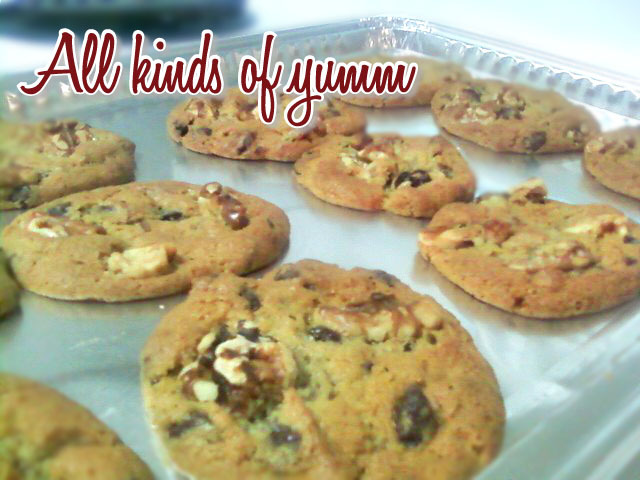 Never in a million years did I think I'd ever make a cookie with nuts in it. I just don't do that. It's similar to my belief that vegetables don't belong on pizzas. I get that it's classy and chic, but there's no room for that in my kitchen. I left the Seneca Journal a little over a week ago, and my farewell gift to my boss was his favorite type of cookie. They just happened to be the thing I would probably never make. God works in mysterious ways. Use a full teaspoon. When making cookies, this is not the ingredient to skimp on. And buy the real stuff if you can afford it. If you only have whole walnuts, throw them in a zip lock bag, get all the air out, and smash 'em. Just improvise. Combine brown sugar, granulated sugar and butter. Beat with a mixer until fluffy and fabulous. Heat oven to 350 degrees. Bake for 8-10 minutes. Let cool on pan for 10 minutes before transferring them to a serving dish or plate. Don't overcook them! If you take them out and they look perfect, that means they're probably overdone. If you take them out and they look 2-3 minutes underdone, they'll be perfect once you let them sit. The goal is to make them chewy, and they continue to cook on the hot baking sheet even after they're out of the oven. That's why it's important to let them sit for awhile before eating them.